A map shows the footprint for the Segilola open-pit gold mine. Thor Explorations is planning to begin construction of its Segilola open-pit gold mine in southwest Nigeria in the second quarter of 2019. Positive results from an independent definitive feasibility study describe a project producing 80,000 ounces per year (oz/y) of gold over a five year mine life. Thor has also reported the results of an independent preliminary economic assessment (PEA) of a proposed supplemental underground project at Segilola that could add 33,000 oz/y to Segilola production over a period of three years. The resource remains open at depth. 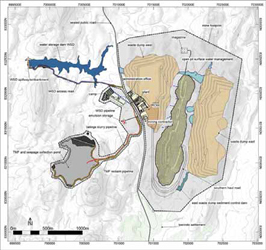 The open-pit project includes construction of a 625,000-metric-ton-peryear (mt/y) processing plant, with a flowsheet that includes a conventional crushing circuit, two-stage grinding, gravity, carbon-in-leach, elution, electrowinning, and smelting to produce gold doré. Gravity recoveries will account for more than 40% of total recovery. Preproduction capital expenditures to develop the project are estimated at $87 million, with an after-tax payback period of 1.4 years. Life-of-mine all-in sustaining costs are estimated at $662/oz. The initial open-pit development is based on a probable mineral reserve of 3 million mt, grading 4.2 g/mt gold and containing 405,000 oz of gold at a 0.77 g/mt cut-off. Indicated resources stand at 469,000 oz, grading 4.7 g/mt, and inferred resources stand at 163,000 oz, grading 7.8 g/mt. The company intends to engage an experienced mining contractor for the drill, blast, load and haul operations. The project has all of its required mining and environmental licenses.